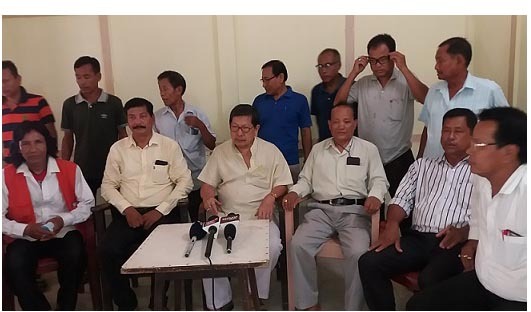 The president of Assam Pradesh Manipuri Association (APMA) Yumnam Nayan Singha demanded punishment for those dishonoured the legend, martyr Bir Tikerdrajit during the programme celebrating the 127th Martyrs’ Day at Manipuri Sahitya Parishad Bhawan on August 13 and acted against the community. “As per our schedule, the programme began in the morning at 8 at the Manipuri Sahitya Parishad Bhawan campus with flag hoisting at 8:30 am and the swahid-tarpan(tribute to martyr) was done in front statue of Bir Tikendrajit in New Market followed by a peace rally which was taken out in the town,” added Singha. He also said in the afternoon, an open session was organised where Deputy Chief Minister of Manipur, Yumnam Joykumar Singh was present as the Chief Guest along with Hojai Deputy Commissioner Manvendra Pratap Singh, educationalist Babatumbi Singh, social worker Krishna Kumar, senior physician Chanu Singh and many other eminent guests. The next day – August 14 – APMA members lodged an FIR in this regard at Hojai Police Station. “Hojai Police has already registered a case bearing No 643/18 in this regard,” they added. The APMA leaders said police apprehended the duo and brought them to the Hojai Police Station and also called the APMA president and secretary. Officer-in-Charge Kiteshwar Baniya asked the APMA members and the persons involved in the conspiracy to amicably solve the matter in order to safeguard the unity and integrity of the Manipuri community.